Common names: Bartlett’s Anthias, Bartlets Fairy Bass. Minimum tank size: 55 gallons. 100 gallons for a small group. Hardiness: Medium. This is one of the easiest anthias species to care for. Unfortunately, they ship poorly. 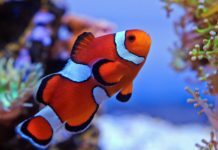 Allow them 3-4 hours to adapt to your aquarium before you release them. Aggressiveness: Peaceful. 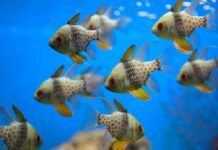 Care should be taken to ensure that you keep only one male per tank as they will likely fight with each other. Distribution: Pacific Ocean: Palau, Kosrae in the Caroline Islands, Kwajalein in the Marshall Islands, Nauru and Fanning Islands in Kiribati. Recently recorded from Tonga. Diet: Zooplankton and floating filamentous algae. Should be fed a varied diet of mysis shrimp, brine shrimp, and other meaty items. They sometimes but not always accept flake food. With their higher metabolism and constant activity, they tend to lose weight rapidly if they are not fed several times per day. 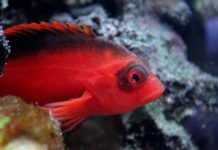 The Bartlett’s Anthias (also known as Bartlett’s Fairy Bass) is native to the Pacific Ocean where it inhabits reef faces and slopes/drop-off areas. It occurs in large aggregations, few males and several dozen females and juveniles. 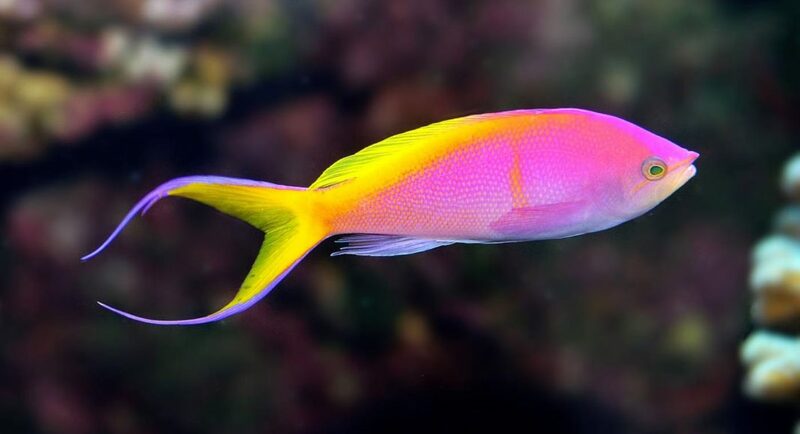 The lower body is pink or purple while the upper third of the body is yellow. The tailfin displays bright blue lines at the upper and lower edge of the tailfin. 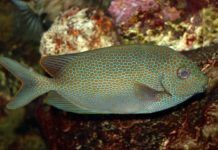 The males have a more intense coloration and the females tend to be lavender in color with a yellow back and caudal fin. Anthias species are hermaphroditic. If a dominant male perishes, the largest female of the group will often morph to take its place. 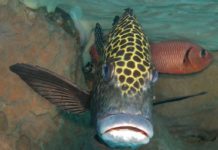 Bartlett’s anthias live in open water above coral reefs and will do best in aquariums that mimic this environment. 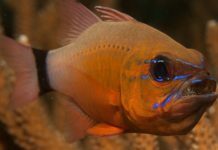 Bartlett’s Anthias is able to adapt to both bright and dim aquariums and is considered one of the easier Anthias to keep in brightly lit aquariums. 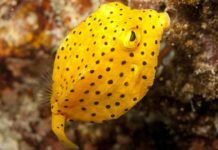 The ideal aquarium should be spacious and provide plenty of hiding places among live rock. It is best to create at least one large overhang where it can rest shaded from the light. It prefers strong moving water, well-circulated aquarium with some calmer areas and optimal water quality. 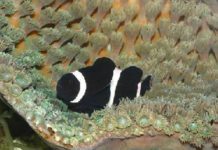 Specific gravity should be between 1.020 – 1.025, pH between 8.1 – 8.4, and temperature between 72 – 78° F.
Try to not keep this species with aggressive tankmates. 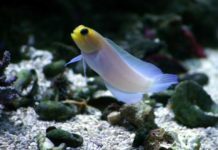 It is also a good idea to introduce this species first into your aquarium. Read more about saltwater acclimating here.